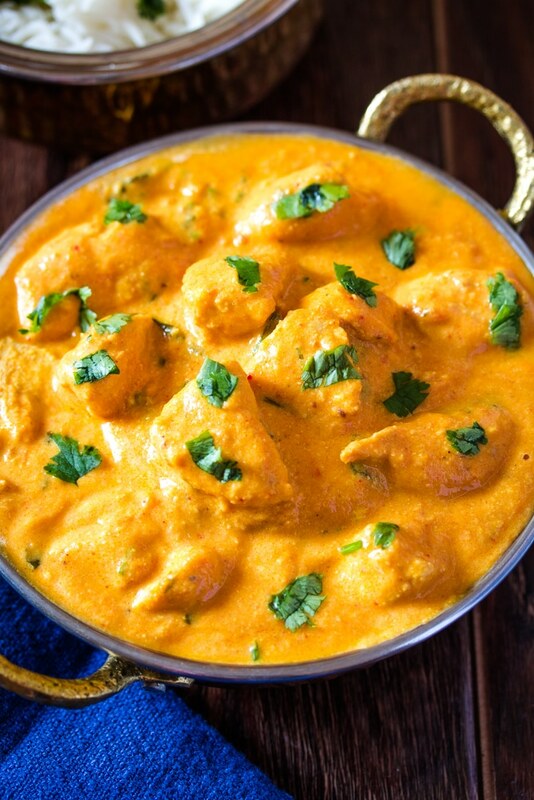 Learn how to make restaurant style Murgh Makhani (aka Butter Chicken) at home…you’ll love the grilled chicken pieces coated in a creamy aromatic makhani curry. And the secret to my delicious Murgh Makhani being so creamy…lies in the cashew nuts…there’s no cream used in my makhani curry. We’ve got a growing collection of restaurant style desi recipes at I Knead to Eat…try this Dal Tadka or Indian Chicken Korma Recipe. But before we discuss the recipe, let’s answer a few frequently asked questions about Murgh Makhani. What does Murgh Makhani mean? 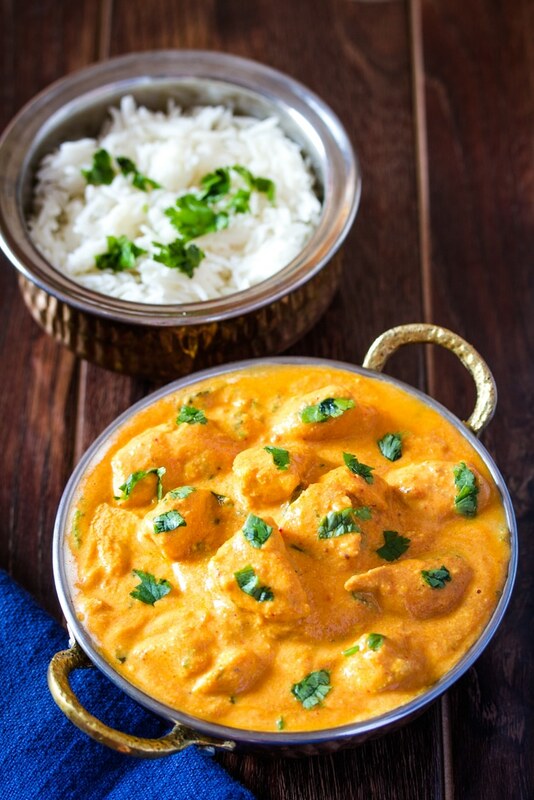 Is Butter Chicken and Chicken (Murgh) Makhani the same? Yes absolutely the same…just different names! What is Makhani Sauce made of? Makhani Sauce is a creamy tomato based curry. It’s made with tomatoes, some aromatics, butter and cashew nuts. It’s finished off with some heavy cream. Some recipes call for only heavy cream and some call for cashew nuts. It really depends on your preference and what you have on hand, but I think the cashew nuts add a really nice nuttiness in addition to the rich creaminess to the makhani curry. Once the makhani sauce is cooked, it’s blended into a smooth creamy curry which is SO good…you won’t be able to stop eating it. 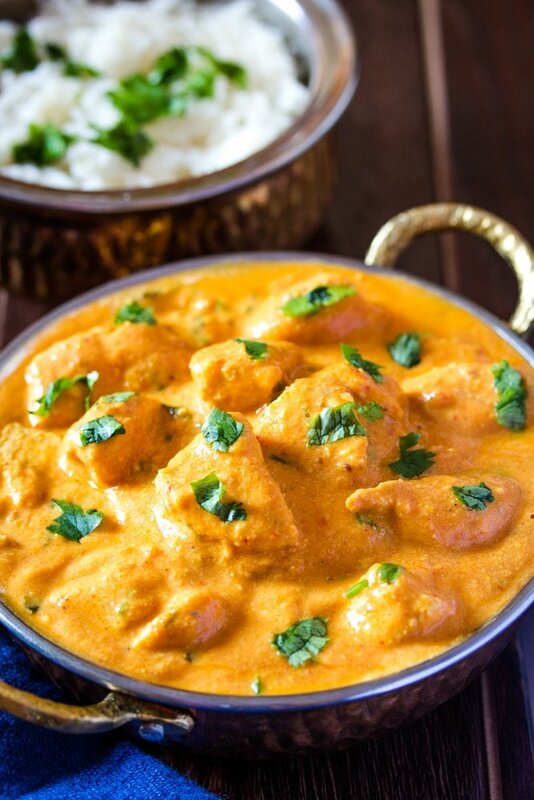 What Spices go in Butter Chicken or Murgh Makhani? Murgh Makhani has two components: the makhani curry or sauce and the grilled chicken itself. Not a lot of spices are required for both the curry and the chicken. These handful of spices are all you need is to make to rich, aromatic and creamy murgh makhani. Contrary to a lot of recipes that call for heavy cream and butter for the makhani sauce, I use no heavy cream in the curry. 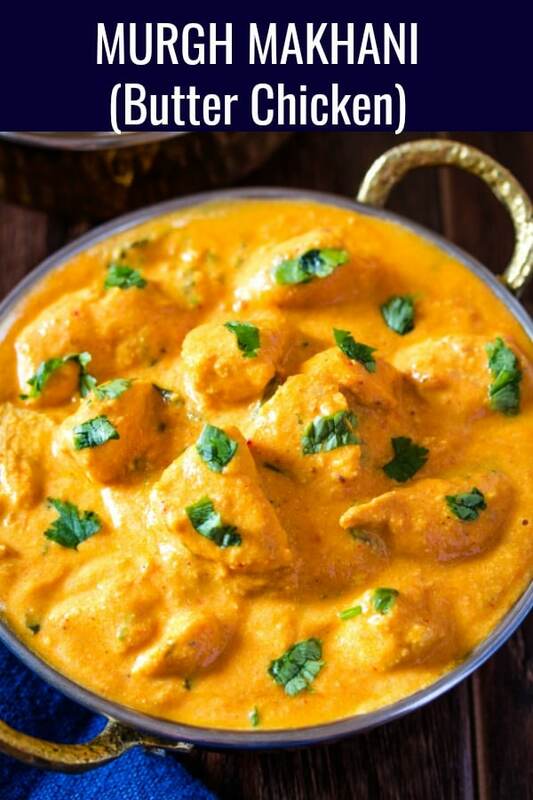 A handful of cashew nuts and a couple of tablespoons of butter are all you need to make a rich and creamy butter chicken sauce. However, I do finish off the curry with some heavy cream. Is a pinch of crushed fenugreek leaves (methi) at the very end of the cooking process. Methi or fenugreek leaves are what add the umami to most creamy, rich curries in the subcontinent. And while you can skip this ingredient if you don’t have it at home or don’t have easy access to it, I think it’s what finishes up murgh makhani and rounds up all the flavors so nicely. How Do You Make Murgh Makhani? Murgh Makhani is made up of two elements, the marinated grilled chicken tikka and the makhani curry. Marinate the chicken in yogurt, oil, red chilli powder, ginger garlic paste and lemon juice for 15 minutes or so. Then grill the chicken on a grill pan until it’s cooked through and charred on the outside. Set aside. In a large pot, add all the curry ingredients and bring to a boil. Lower the heat, cover the pot and cook for 20-25 minutes or so. Using a hand blender, blend the curry into a smooth consistency. You may need to add 1/2 cup of water for easier blending. Alternatively you can use a normal blender to blend the curry. 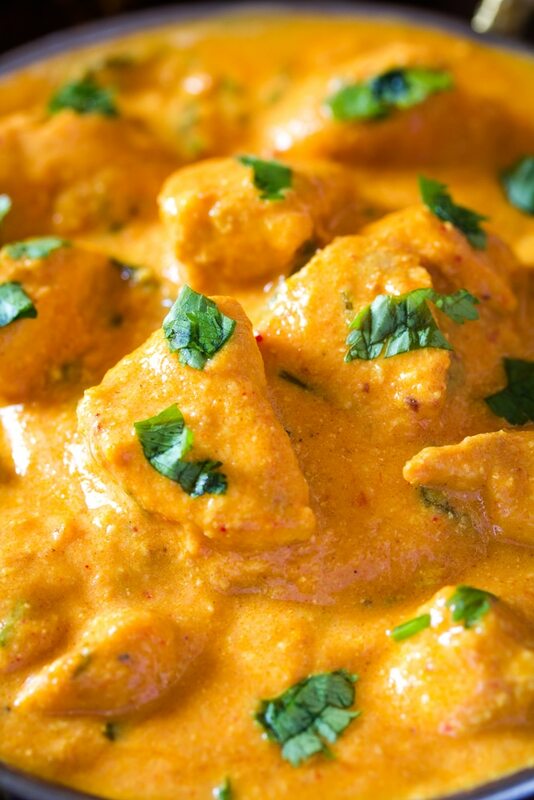 Add the chicken tikka pieces to the prepared curry, and bring to a simmer and cook for 3-4 minutes. Top with fenugreek leaves powder and heavy cream. Stir through the curry, and serve immediately with naan or rice. Note: for the full recipe ingredients and instructions please scroll down to the recipe card. And that’s about it…that’s how you make super delicious Murgh Makhani at home. 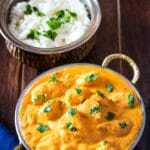 Learn how to make restaurant style Murgh Makhani at home…you’ll love the grilled chicken tikka pieces coated in a creamy aromatic makhani curry. And the secret to my delicious Murgh Makhani being so creamy…lies in the cashew nuts…there’s no cream used in my makhani curry! Using a hand blender, blend the curry into a smooth consistency. You may need to add 1/2 cup of water for easier blending. Alternatively you can use a normal blender to blend the curry. Mix all the chicken tikka ingredients and marinate for 15 minutes or so. Heat a grill pan on high heat, add some oil and grill the chicken until it is cooked through and charred on the outside.